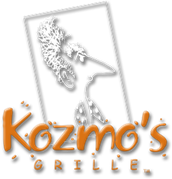 Add a choice of Kozmo chips, fresh-cut French fries, rice or corn cake for $2.29. / Onion rings, Kozmo chips or Sweet Potato Fries $2.99 / Add a cup of soup du jour or dinner salad for $3.79. Create your own half-pound Certified Angus Beef Steak burger served on your choice of Kaiser or multigrain Ciabatta roll. Crispy chicken breast served on your choice of Kaiser or multigrain Ciabatta roll with choice of spicy Buffalo sauce, regular or chipotle mayo. Sirloin steak grilled to order and sliced on a bias dipped in au jus and prepared Philly-steak style on a French baguette with mushrooms, onions & choice of cheese. Served with creamy horseradish sauce or chipotle mayo. Grilled chicken breast with avocado, Applewood smoked bacon, tomato and melted provolone cheese on your choice of Kaiser or multigrain Ciabatta roll. Turkey, Applewood bacon, lettuce, tomato, and chipotle or regular mayo on Italian, rye, or wheat toast. Pan-seared chile-lime tilapia with cilantro-lime cole slaw on flour tortillas. Garnished with Southwestern remoulade. House-made crab cake topped with Applewood bacon, lettuce and tomato. Garnished with Southwestern remoulade & served on your choice of Kaiser or multi-grain Ciabatta roll. Pan-fried shrimp tossed in slightly spicy mayo-sweet chile sauce and served in flour tacos garnished with chopped Romaine. Served with Asian chile dipping sauce.